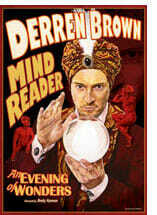 OK, this should be the last post about how Derren Brown’s lottery trick was done! I think we’ve given enough publicity and space over to Mr Brown. Derren sadly disappointed on this one – his ‘How To Win The Lottery’ show actually failed to deliver on the fundamental promise made earlier in the week. Did you guess how ‘Derren Brown: The System’ worked? Did you spot it even before the coin toss trick?